The BD FACSCalibur™ platform allows users to perform both cell analysis and cell sorting in a single benchtop system. 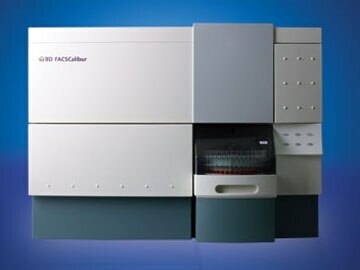 The system supports a variety of research and clinical applications and is complemented by a broad suite of intuitive software solutions to streamline analysis for a wide range of applications including enumeration of lymphocyte subsets, stem cells, residual white blood cells and reticulocytes. After supporting the BD FACSCalibur's long and successful tenure in the marketplace, BD Biosciences has made the difficult decision to stop selling the BD FACSCalibur instruments, options and upgrades. Find out more about newer technologies available to you. The optional BD FACS™ Loader provides walkaway automation using a removable 40-tube carousel and onboard mixing for tube-based assays.